Regina Lord was born and raised in northern Arizona and has lived in Arizona for most of her life. She has been living in Tucson, AZ with her husband and two boys for over 10 years. She was very interested in art at a young age and was encouraged to be creative by her loving grandparents. Regina studied art throughout her school years along with studying to become a registered nurse and received her Bachelors in the Science of Nursing from Northern Arizona University in 1999, working as a pediatric, mother baby nurse and lactation consultant for 13 years. 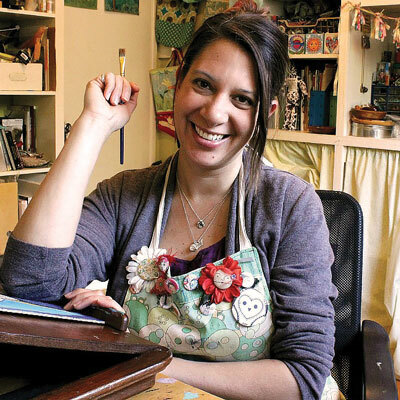 She left her nursing career in 2012, to pursue her creative dreams of being a full time artist and now spends most of her time making art and playing with paints and other interesting mediums. Regina started her business, Creative Kismet, originally as her personal blog. The blog served as a way to share her many passions: photography, sewing, crafts and cooking and eventually morphed into her place to share her growing passion for art. 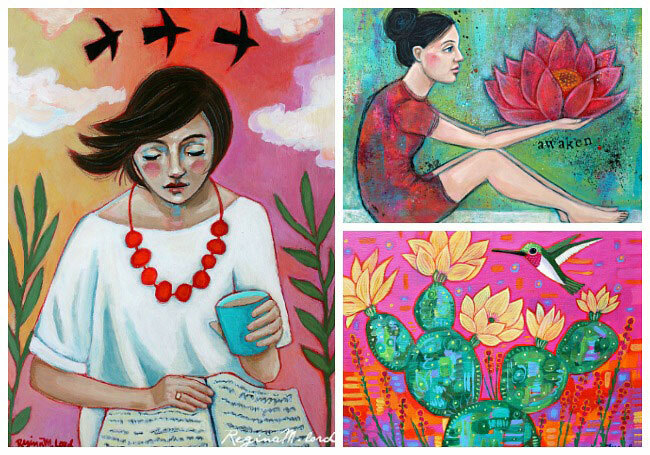 She started with sketches, then watercolor illustrations and then started a serious love affair with acrylic painting, her medium of choice. She loves creating layers and layers of vibrant color and texture. Her favorite subjects include strong, brave women and colorful, lively nature scenes with birds, flowers, and desert landscapes. 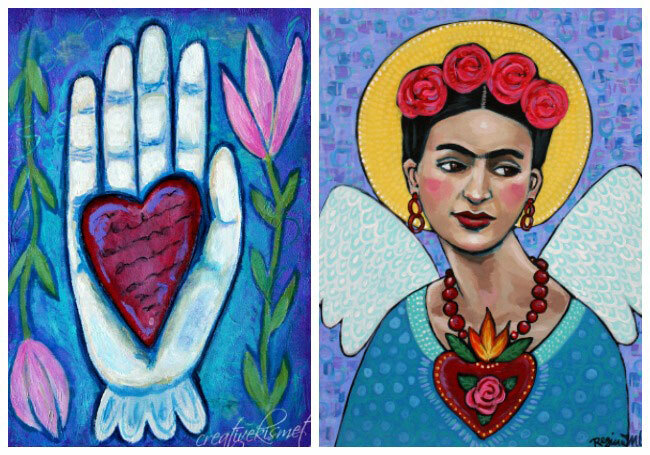 Her art encompasses feelings of lightness and joy, while her style is the unraveling of a woven mixture of her Hispanic heritage, her deep rooted love for folk art and an enchantment with magical whimsicality. 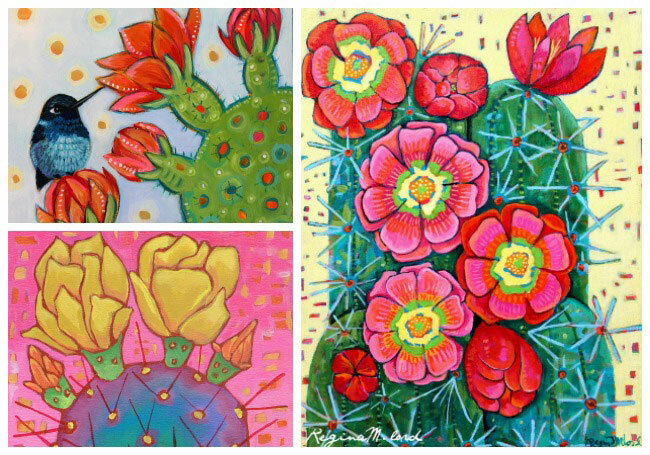 Regina is strongly influenced and inspired by the warm weather, bright sun and the Mexican colors, style and architecture that are predominant here in the southwest. She is constantly looking for beauty, whether it be on a walk with her dog, a bike ride or a trip to the store. She sees it in the light, in shapes and patterns, in colorful buildings or clothing and in the people all around her. She is constantly sketching out things she sees and ideas she has in her very large collection of sketchbooks. She finds her special magic in the painting process though. She may start with an idea, but more often than not, the painting becomes alive and morphs into its own new thing which is both fun and exciting. Regina sells her art and creations on her website, www.creativekismet.com and also attends various art shows in the Tucson area, including the Mercado San Agustin, Tucson Museum of Art and Chris Bubany's Holiday Market. She participates in the local studio tours as well. Regina's art is currently being displayed at Tohono Chul's Garden Bistro until March 9th. Regina is very passionate about doing what she loves and incorporates art into her daily living whether through painting, drawing, photography, art journaling. You can also follow her and learn more about her creative passions on her blog, Instagram, and Facebook.